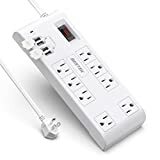 Electronic devices are becoming so ubiquitous that most people have long since run out of outlets and have resorted to power strips to expand their capacity. This grants additional connectivity to plug in more TVs, laptops, chargers, and VR headsets. However, there’s a notable downside to this idea. Having more personal electronics means more of your entertainment and productivity is at risk from power surges. A power surge can do some serious damage to unprotected electronics. That’s why it’s important to invest in not just a good power strip, but a surge protector. In this post, I’ll run down what I consider to be the best surge protectors available. 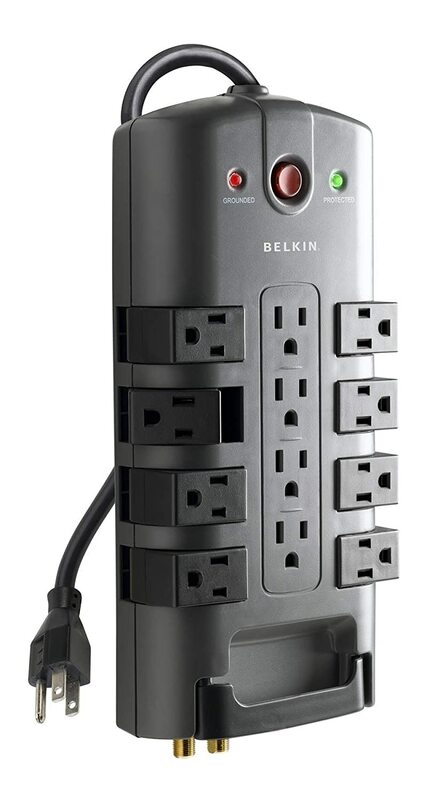 The BP112230-08 from Belkin is my pick for the best surge protector on the market as of this writing. It has good reach, a very nice design and arrangement of outlets, plenty of capacity to run a desk full of electronics or a home entertainment center, and a few sweeteners that will help convert you. It’s also got an extremely high tolerance for surges and a high warranty on any connected electronics in case anything does happen. Let’s start by discussing the physical details of the protector. It measures 11.4 inches by 3.97 inches by 1.1 inches, and that doesn’t include the 8-foot cable, obviously. It weighs 2.54 pounds, which is not bad considering the size. The unit takes the shape of a rounded rectangle. The BP112230-08 has a total of 12 outlets. Four of them are arranged down the center of the surge protector. The other 8 are split into two groups: four are on the left side of the unit, and the other four are on the right. The 8 on the outside edges each have their own swiveling joint, so you can turn them to face at various angles. The overall design and placement of the outlets is brilliant. The four in the middle are spaced out enough that even the largest plugs will fit them with no problems. The edge outlets are very convenient for helping you deal with the awkward cable placement that often comes when you are trying to put the surge protector in an out of the way spot, like under a desk or between a cabinet and the wall. It’s a feature that shows the designers really thought hard about how the user would place it in their home. As for the surge protection itself, it is excellent. The BP112230-08 is rated for 4320 joules, which is quite good. On top of that, it comes with a lifetime warranty and a $300,000 Connected Equipment Warranty. The BP112230-08 is designed to protect the quality of audio and video signals, so that your TV and voice communications will function uninterrupted. 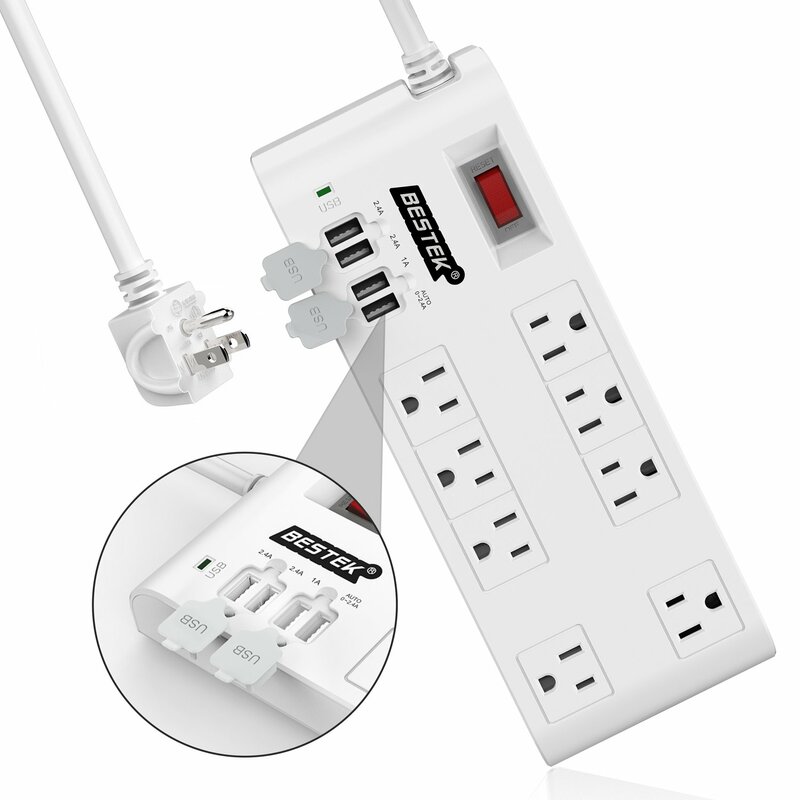 In addition to the outlets, the surge protector has 1-in 2-out RJ11 connectors for your phone line. That’s a great feature that you won’t see on every surge protector. It means that more of your electronics are safe from surges. Any device that uses a phone line, which you would normally plug into the phone jack in the wall, can now go through the surge protector. The BP112230-08 lists for $35, and you can usually get it for a better price when you look online. That’s quite a low price considering all of the features and the excellent design of the unit. 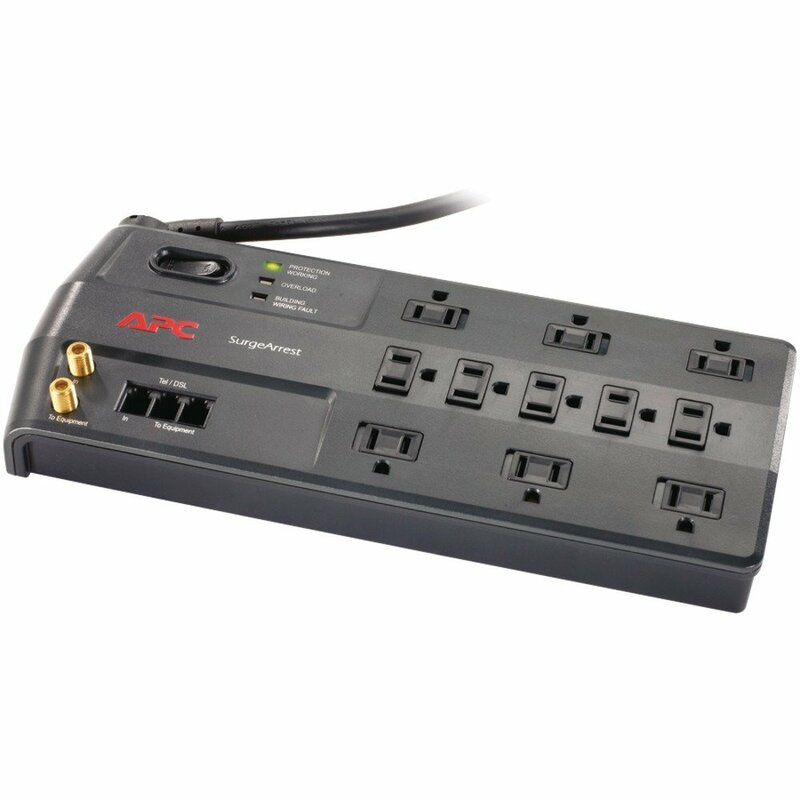 Consider the fact that you are getting 12 outlets, plus the RJ11s, and it comes with a lifetime warranty. When you think about all of that, it’s hard to argue against the BP112230-08. The one downside is that sometimes, the customer service at Belkin is not the best. In the past, some people have had problems getting their lifetime warranty honored. Not that they never got their replacement unit, but the process used to be somewhat annoying. It has improved in recent years, so it should not be nearly as much of a hassle as it used to be. The construction and quality of the surge protector itself are unassailable. That’s why I’ve named this my Gold pick: it’s one of the best-designed surge protectors available and it costs a tiny fraction of any of the electronic devices you will plug into it. My runner-up is from APC, and it has a slightly higher list price of $40. Keep in mind that anytime you see me discuss a list price, the item is nearly always available for less than that. I just don’t want to give specifics because the on-sale price changes and I don’t want to provide outdated information. In any case, this item is meant to tbe a little more expensive, and that is part of why I only gave it the #2 spot. It doesn’t really have a whole lot that the Gold pick does not already have, so that means there is not much point in paying more for less. Here’s the details. The APC 11 measures 2.4 inches by 13.7 inches by 7.5 inches. It weighs 2.34 pounds. That makes it roughly comparable to the Belkin model. However, instead of having 12 outlets in only has 11. That might seem like a minor quibble, but the next point is a little bigger: the arrangement of the outlets is a little too tight. The outlets are close together, so one large plug can make it impossible to plug in something next to it. That affects how useful the surge protector really is. Of course, if you don’t have that many devices that have big plugs, this is less of an issue. The arrangement of the outlets is similar to the Belkin. First, there’s a line of five outlets down the center of the unit. These are the outlets that are too close together: a big plug in the center can block off at least one and possibly two others. Each side has three additional outlets. These are spaced out apart from each other as well as from the center row, so there’s some room to place big plugs here. However, they don’t rotate or swivel, so the space is a little inconvenient to work with. These big plugs take up a lot of space and tend to jut out over the edge of the protector. Like the Belkin, the APC 11 comes with RJ11 outlets as well. However, the level of surge protection is lower. The APC is rated to 3020 joules of energy. The warranty is also lower compared to the Belkin, at $100,000 of coverage for connected equipment and devices. That’s on top of the somewhat worse design. The best reason to pick up the APC 11 is when it goes on sale and costs notably less than the Belkin unit, which occasionally happens. Similarly, if you do not posses electronics that have big plugs, then the design shortcomings are not likely to bother you. The lack of a swiveling edge outlet can be annoying, but that feature is hardly a necessity. The Belkin unit will meet the needs of a greater variety of users, but that doesn’t make the APC useless- far from it. It’s just a different approach to surge protection. The BESTEK surge protector is an interesting beast. At a list price of $36, it is comparable to the other two surge protectors on this list. Furthermore, the design is fairly unremarkable. It is a plain white rectangle with two rows of outlets. The element that makes it stand out the most is the collection of 4 USB ports for USB charging located near the top of the unit. That’s a very nice addition that helps an otherwise pedestrian surge protector stand out from the crowd. Getting into the specs, the BESTEK is actually a little heavy at 4.7 pounds. That can make it a little awkward to place. It measures 10 inches by 3.8 inches by 1.4 inches. For convenience, it has slots in the bottom or back side that allow you to mount in on the wall or on any other surface. You can get creative with this: mount it on the inside of a home entertaintment center to help keep your wires controlled or out of site. Mount it to the bottom of a table to create a charging station. The other protectors on this list have 8-foot cables, but the BESTEK’s cable is only 5.2 feet long. That’s somewhat disappointing and limits the extent to which you can use the surge protector. The BESTEK has 8 outlets which are arranged in two rows of four. Each row has one outlet that is a little separate from the rest to give you some room to add a big plug. This still is not great design because if you have more than two devices with big plugs, you will wind up overlapping with other outlets. There is some good news, though. The outlets all have the ground facing outwards, which is smart for arranging the cables in a convenient way. The four USB ports are really the star of the show. More and more smartphones and tablets have USB chargers, so this caters to that functionality. It’s a smart and forward-looking touch. The location is, again, not the best: the four are close to where the surge protector’s cable enters the unit. It would probably be more convenient if they were at the other end, which is more free to move. However, the thought is there, and it’s the only good protector that has USB ports. That doesn;t make the BESTEK flawless. The product is worryingly vague about how much surge protection it actually provides. It has a five million-dollar warranty for connected devices, which seems so high that it is more of a publicity device than a meaningful cap. Anyone who can connection five million dollars’ worth of electronics and assets to one surge protector should probably opt for a different protector entirely. This is a great option if you have a lot of mobile devices that you like to charge at once. On the other hand, there’s nothing stopping you from just plugging in a laptop and charging your phone using the laptop’s USB ports. That will take up more space, but it can give you the same outcome. If you don’t know about Amazon Basics, now is the time to learn. The brand is essentially Amazon’s version of a generic brand in a grocery store, except that it covers a huge variety of products. You can get some amazing savings with them. Check out their entry into surge protectors. It’s an extremely basic design, but it costs just ten bucks. No matter how good the sales are, this protector is almost guaranteed to be the cheapest option. The design is a simple black rectangle with 6 outlets in a row. One of them is set apart so that it can accommodate larger plugs. The others don’t have much room between them, which can make them hard to work with. It has a 6-foot cord, which is shorter than the Gold and Silver picks. Near the top, there is a red light that glows when the unit is functional along with a rocker switch for controlling whether it provides power or not. There are slots in the back so that you can mount it on the walls. The big failing with this surge protector is in the protection. It is rated for only 790 joules, which is quite low. That won’t do much to protect delicate electronics. Amazon also does not offer any kind of insurance or warranty for connected devices. These two facts alone should make you a little wary of the surge protector. In fact, it is in reality little more than a power strip with a small amount of surge protection, not a surge protector in itself. As long as you keep that in mind, you won’t be disappointed. The Amazon protector is plain and basic, but it gets the job done at the best price on the market. Just remember its role and don’t rely on it as your only source of surge protection. That could leave you with damaged devices and no recourse. In other words, you should consider this to be an enhanced power strip rather than a true surge protector. That said, the price is truly unbeatable. The other good side is that if anything goes wrong with the product, you can just deal with Amazon directly instead of a third-party seller. They can answer all questions related to both shipping and customer service for the power strip. Every power strip has a different level of actual surge protection. This is usually listed on the product’s packaging or online listing as an amount of energy in joules. The higher this number is, the more the surge protector will be able to prevent surges of power from reaching your electronics. For example, if the protector is rated for 3000 joules and a surge of 3,300 joules hits it, then it might not be able to prevent the surge from burning out your connected devices. If you are unsure how much protection you need, try asking your power company for advice. The next thing to think about is how many outlets the surge protector offers. You will likely need at least 6 outlets, and 8 would probably be better. Even if you don’t have that many devices to plug in right now, you are likely to acquire more in the future. You should anticipate this and leave yourself a few extra open spots on the surge protector. However, the location and placement of the outlets also matters. Many surge protectors are imperfectly designed, and leave insufficient space for larger plugs. They also might be hard to use because the plugs interfere with each other or hang off the side. Try to visualize how the plugs would be oriented and where all the cords would go before buying any particular model of surge protector. It will save you a lot of aggravation. No surge protector is perfect. When a surge comes, the surge protector is designed to break. For that reason, most protectors come with a lifetime warranty. You call up the company after a surge happens and they will replace it for free. If there is no such warranty, then you will need to re-buy the surge protector, which can be annoying. The other warranty that a good protector will offer is a guarantee of coverage for connected electronic devices. This warranty will provide you with compensation if a surge occurs and the protector fails to prevent the surge from damaging the electronics plugged into it. That way, if something goes wrong and your computer, TV, or smartphone is burned out by a surge, you can replace it using this insurance from the company. That saves you a considerable amount of money, because a good policy will have a very high limit. Make sure to get in touch with the manufacturer to ensure that you are in compliance with any requirements that you need to fulfill in order to make a claim. As you can see from this list, it is very possible to get a great surge protector for less than $30. There are many on the market that claim to be especially powerful and which cost significantly more. Unless you need the surge protector for an industrial use, then it is essentially never worth it to buy these expensive products. They really do not offer you much more in terms of functionality to justify their higher price. The products I have selected are not just the best in absolute terms: they provide you with the best value for your money. Surge protectors are important, but that is no reason to overpay for them. Even if you do not choose one of the products I recommend, it is a good idea to use this list as a starting point. You can see which features I consider important and how much you should pay for them. Most good power strips should be reliable, and that is where the warranty covers you. Avoid buying an off-brand surge protector that does not carry any warranty protection. That will mean you run the risk of damaged electronics with no way to get compensation. It might seem like a minor issue, but the first time a power surge hits your house, you will appreciate having the protectors there. One last note: remember that it is normal for these protectors to burn out and stop working after one surge hits. This is by design. They are meant to take the hit so your TV doesn’t. If your surge protector works as intended, than it’s possible you may need to replace it at some point. It’s nice to be able to do that at the expense of the manufacturer.